The Saturn Junkyard: Wipeout: The Greatest Racer On The Saturn? 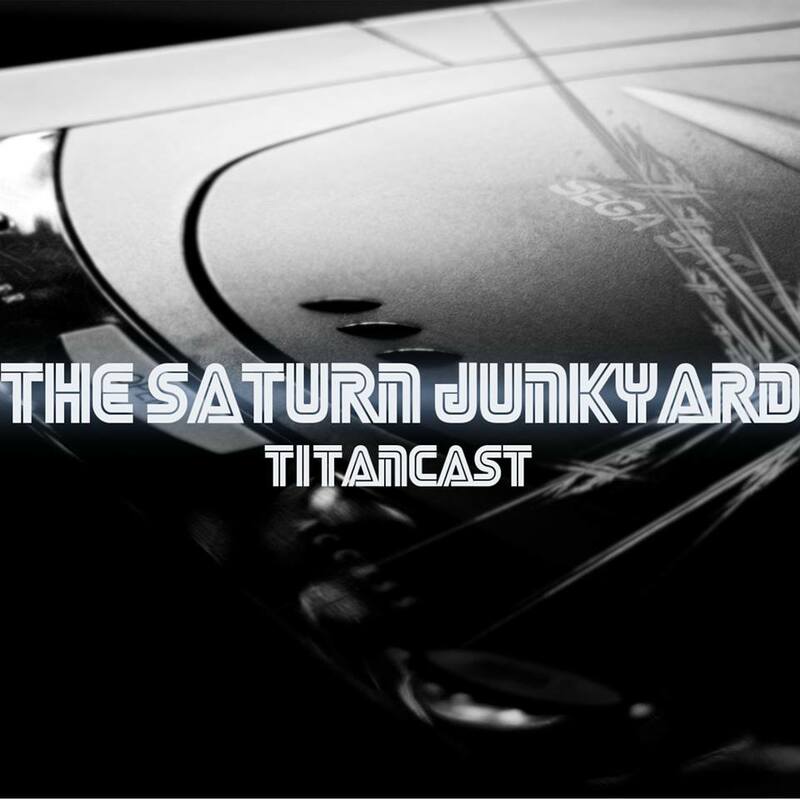 Hello Saturn Junkys! First of all, let me apologise profusely to all of you rare creatures that find yourselves here, having a little read every now and then. 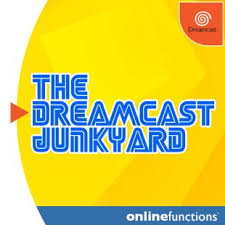 This is supposed to be the Junkyard's main hub, the place we all come to find new and interesting opinions, stories and articles about our favourite console. 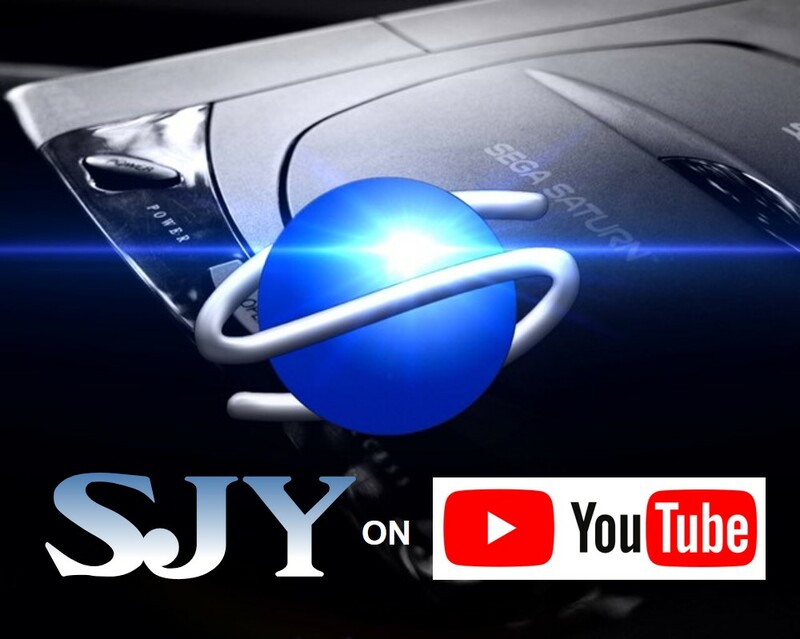 Whilst original team member Nuno has been producing Junkyard YouTube videos which receive thousands of hits, he's also been writing articles on emulation and generally putting this old Father to shame... In fact, in May 2018, for the first month since the 'Yard reopened, I have contributed nothing to it's hallowed pages. As an excuse, I'll throw in a couple of those hiccups that life sometimes throws at you, one of the warmest, driest, sunniest Mays since records began, a birthday and some major yardening... but enough of the past, May has gone. Now we're in June; the mid-way point of the year. The sun is shining, the birds are singing and summer feels like it has arrived with a bang for the first time in years! 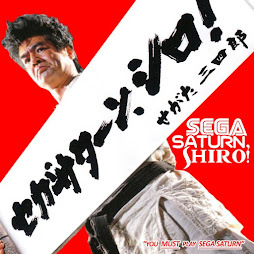 Time to shut those curtains, crack yourself open a cold one and get your Saturn on! 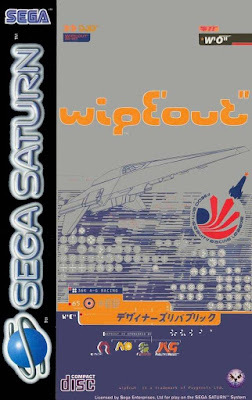 So by now I'm guessing the title of the blog piece has been a bit of a giveaway... today we're talking about Wipeout, a fast, futuristic racer with a penchant for jet powered hover-cars, majestic sweeping race tracks and an acid house/drum & bass fuelled soundtrack. 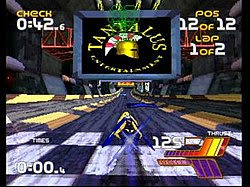 This is a game which originally appeared on the PlayStation, produced by legendary publishers Psygnosis and indeed became something of a flagship title for that console. So how did it end up on the Saturn? Did we get a decent port? And is it still worth playing now? 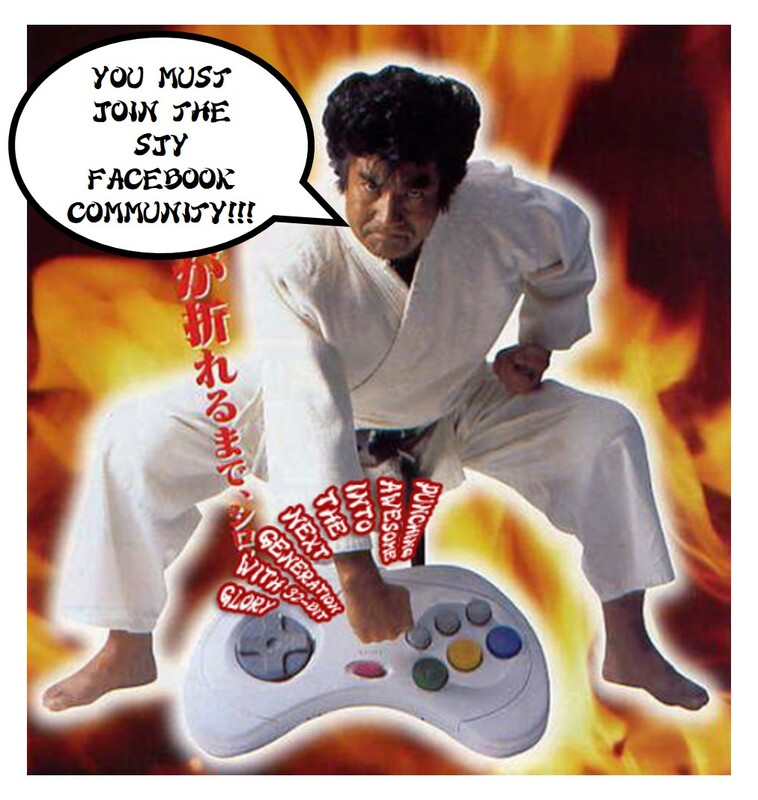 To begin to answer those questions, we have to go back to 1995, when the PlayStation was a boorish king, lording it over the humble Saturn, and an ecstasy fuelled acid house aesthetic, had infected every advert, clothing line, youth TV show and radio station. Gaming and raving were about to be united in a way they had never been before. Even as early as 1995, Acid House, Techno and Drum & Bass had very much found their way into the soundtracks of dozens of games. Sega itself would employ the afore mentioned musical genres on plenty of titles... Sega Touring Car, Sonic R, NiGHTS and Athlete Kings to name but a few. 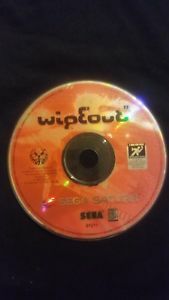 Whilst Sega tried to fuse itself into the minds and wallets of ravers with it's Club Saturn project, Psygnosis were about to go a step further. 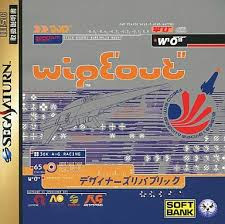 They would employ the work of established rave giants, The Chemical Brothers, Leftfield and Orbital to create the soundtrack for their newly developed futuristic racer, interestingly and simply titled: "WipEout". (with a great big "E" in the middle... Geddit???) The intention of the project was a synaesthesia of gaming and raving, possibly to be enjoyed in the same MDMA impacted frame of mind. The idea would eventually reach it's peak in the wonderful "Rez" on the Sega Dreamcast. The game itself involves the racing of futuristic flying cars or hover-ships, set as it is, in 2052, with you playing as one of a number of skilled racers from the F3600 "anti-gravity racing league." As the player you must choose your driver and vehicle. Each car has different characteristics in terms of handling, thrust, mass, top speed etc. (and therefore it is to your advantage to experiment with each car and driver.) As well as the large choice of drivers - each one representing a different corporate sponsor based in the future world... "AG Systems, Auricon, Direx and Feisar". - there are a good variety of tracks too. The drivers are a cosmopolitan mix of nationalities, ethnicities and genders, so look for the one that suits you best. I had leaned towards British racer "Paul Jackson", over the last couple of days, but his vehicle had no thrust and he failed spectacularly on courses with big jumps, so I'm now returning to my original choice of driver... the verycrusty, trusty and oh so thrusty, "Kel Solaar" of Direx! Each race consists of a number of swoops, curves, banks, drops and climbs. The cars "hover" just above the road, and following the course is pretty much mandatory. I could be wrong, but I've never found any shortcuts or alternative routes on any track so far. Each track has it's own information screen, showing the layout of the track, giving stats about it's length and location etc. 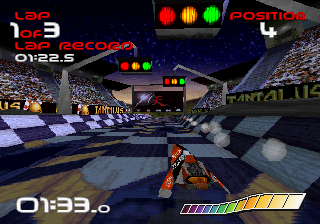 The graphics are pretty sweet for the 32 bit era and the designers put a lot of thought and effort into the environments the player would experience as they race round each track, set in countries such as Canada, Germany and Japan. To give the tracks a bit of added spice, certain sections of the tracks are coloured to denote speed 'power boosts' and the collection points for various weapons with which to sabotage your opponents vehicles, or shields to protect yourself (Mario Kart style). 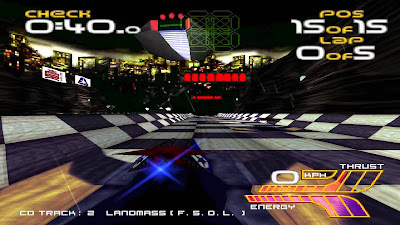 The boosts are what one tends to look out for however, the combat element of the game being very secondary to the racing. Controls are easy - B button is your thrust, D-Pad direction buttons left and right and shoulder buttons are air-brakes that cause you to bank. Thus the vehicle handles more like a flying machine than a car. It's at this point that I must mention the physics. Your car "flies" very believably and blissfully enjoyably round the track. A good run without hitting anything feels sublime. Immersion is quick and intense. But hitting the sides of the narrow tracks or hitting another vehicle feels terrible. There is no grinding crunch sound. No rumble pack vibrating away within your controller. Yet the faintest clunk sound as you bump into the wall signifies a severe drop in speed and can cost you vital seconds. The absence of any drama, explosions or damage as you crunch your vehicle, seems to somehow intensify the experience. What you're looking for as you race around the three laps of each course , is a silent, seamless glide from the first lap to the last. 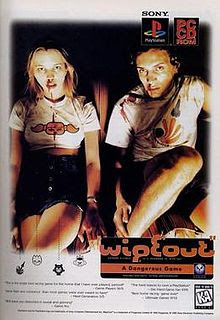 Well, be fore we even get to the game play or visuals, that golden soundtrack, supplied by the likes of the Chemical Brothers, Orbital and Leftfield, was wrenched away from the game by Sony, who retained the rights to the game's original music. 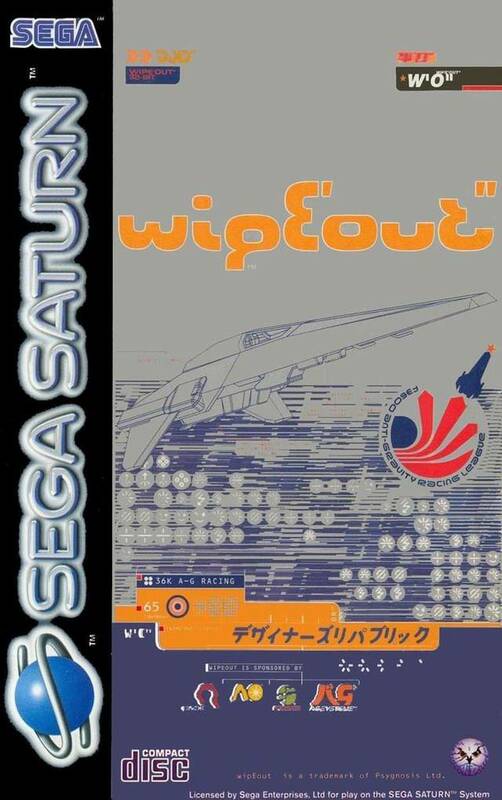 Hats off to Psygnosis here however, because they actually did a great job creating a fantastic acid tinged soundtrack using their own in house composer, Welshman Tim Wright, under the name "Cold Storage". The game is admittedly difficult. The courses are narrow, with lots of twists and turns. The opponent vehicles are difficult to pass and you can find yourself bumping walls and vehicles in a way that you might find maddening at first. But stick with it and you'll soon find yourself improving. When you start coming first and achieving those sustained periods of uncluttered and collision free gliding you'll start to feel an elation and energy rush similar to the feelings intended by the designers. Play it on a wide screen TV, with all the lights off in the room and your soundtrack pumped through a good speaker system and you'll experience a racing game like no other! If you clock all of the courses. You will pass from Venom Class to Rapier Class, which makes a hard game, much harder. Beat the game in Rapier Class and you can unlock the secret track which is on Mars. Definitely my favourite game of the moment! great article father K! i’m ashamed and cannot believe i’ve never played this, i’ll get on this! When I first played it back in the day I couldn't get used to the controls and found it incredibly frustrating. Years later it finally "clicked" for me and, as you've said, pulling off a perfect lap without hitting any walls feels sublime. The fact that it's a pretty bare bones game in terms of single-player structure (no career mode of anything of the sort) makes it all about the gameplay itself. It's not about beating the game, but enjoying the actual racing. I never knew about the differences between the Saturn and PSX versions. 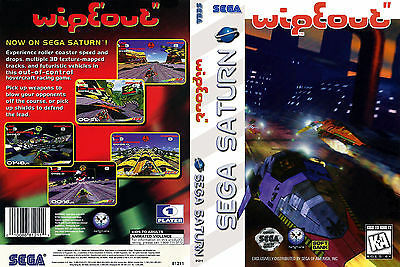 I loved the first one on the Saturn, but the sequel, for whatever reason, always felt weird. 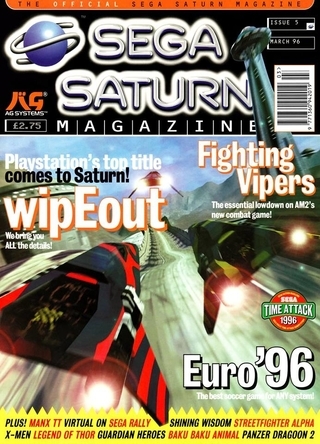 I then tried the PSX version and loved it, while going back to the Saturn never sat right with me. Would like to know what changes to the gameplay were mode between those versions. I remember watching the trailer for this game, but never had the chance to play it. I think I’ll have to pick up both the PS2 and Saturn. Erosion of this game after reading this article. Im sure it would be a nice a break from Rez! Policenauts - The Greatest Story Ever Told?